As the weather slowly warms up in New York, running starts to become pleasurable, and the runners leave their winter hibernation. With the start of Spring weather, it also became the start of my running season and my first New York Road Runners race of the season – the City Parks Foundation Run for the Parks 4M. My first race of the year began on the east side of Central Park at 68th Street. A crowded start at the start slowly opened up as the road widened and we began running up the east side to the 102nd Street transverse for almost two miles, including Cat Hill to challenge us early in the race. Turning left on the transverse brought us to the two mile marker and a nice flat run west across the park. Turning left onto the west side brought us to the rolling hills as we headed south for almost two miles. A left turn on the 72nd Street transverse brought the finish line into view around the bend. 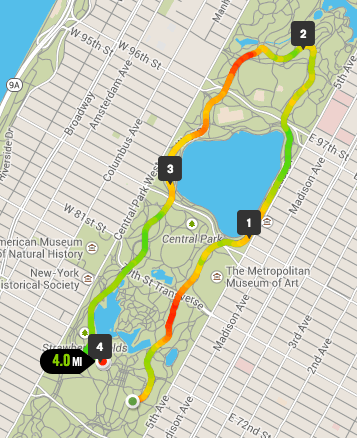 A four mile run around the center loop of Central Park completed my first race of the season. While I didn’t feel like it was my best race at the start, I was able to pick up and finish the race in 32:18, besting my previous 4 mile time by 30 seconds for a new PR. Overall the run felt good and I enjoyed finally being able to enjoy the weather with a race and look forward to more races this season.